How can I use ls while using -l (long listing) without showing the file permissions? I have found a solution close to what I'm looking for, but it doesn't maintain the syntax colouring or spacing. --color=always makes ls always output colour ESC codes, even when piping to another program. The sed script removes the first field (the permissions). Not the answer you're looking for? 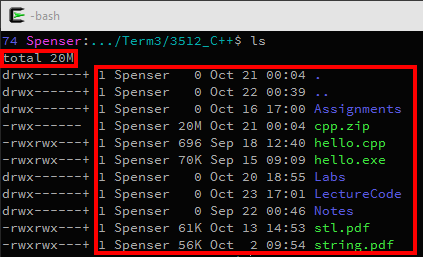 Browse other questions tagged command-line ls or ask your own question. How can I display octal notation of permissions with ls - and can octal represent all permissions? Is there a way to simulate a “Close” event on various windows using the terminal? What is the best way to pipe the output of a command through a pager if (and only if) it is too long? How to prevent `rlwrap` from saving a password in an input history file?